The Full Adder able to "calculate" the sum of 3-bits and hence give results like 0, 1, 2 or 3 (decimal numbers) which 00, 01, 10 or 11 binary. In order to create adders for N+N-bit addition must you take N Full Adders and connect the in a chain. The principle will be very much the same when we do the addition by "hand" at a sheet of paper. 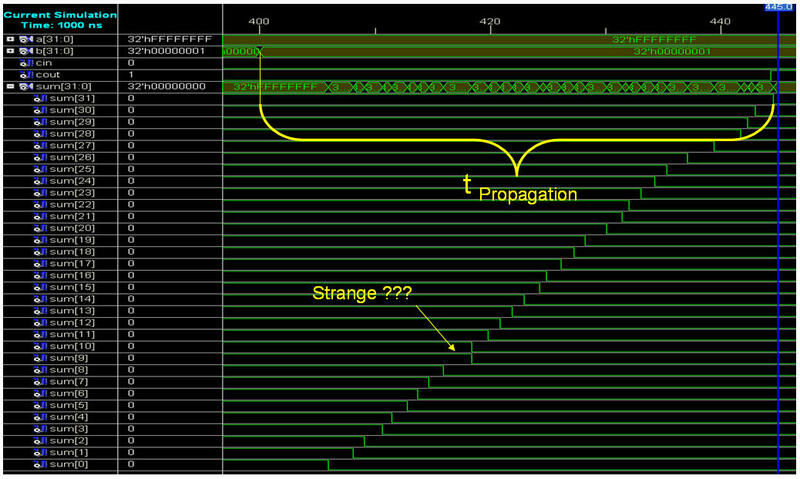 The good thing about Ripple Carry adders the relative simple hardware it takes to form a N+N-bit adder. The bad thing can be found the nature of the Ripple Carry. 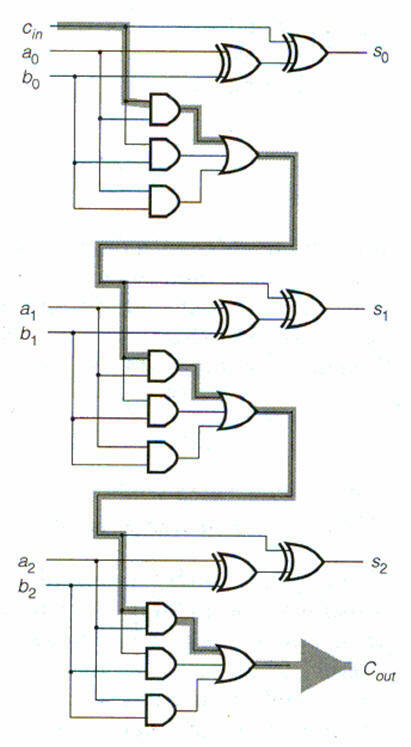 It cost 2 x Gate delays for each stage formed by a Full Adder. Alternative version of the FA which in the end will be implemented the same way as the "Text-book" version above. 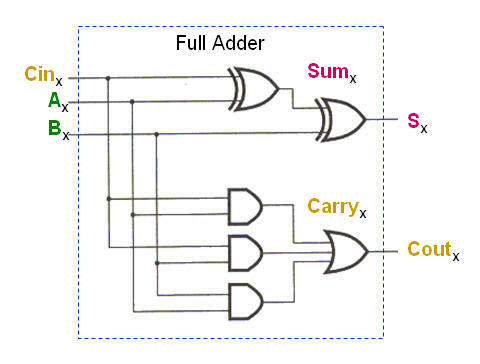 Implementation of a 32+32-bit adder with a generate statement. One way of implementation could be a schematic diagram with 32 Full Adders drawn and connected in a chain. Alternative could a Structured VHDL code be written with the same result - 32 Full Adder connected in a chain. The most elegant way how ever to use the generate statement of VHDL and an internal Carry Vector with N+1 elements. Each Full Adder will then take a Carry from Carry(i) and produce the next Carry for Carry(i+1). The Last element in the Carry chain will in the end be the new Cout value. Just as expected will the ripple nature of the Carry be shown in a simulation of the Ripple Carry adder.